"Wedding at Cana" redirects here. For the Veronese painting, see The Wedding at Cana. The location of Cana has been subject to debate among biblical scholars and archeologists; several villages in Galilee are possible candidates. Although none of the Synoptic Gospels mention the marriage at Cana, Christian tradition based on John 2:11 holds that this is the first public miracle of Jesus. It is considered to have symbolic importance as the first of the seven signs in the Gospel of John by which Jesus' divine status is attested, and around which the gospel is structured. It is still a matter of discussion among theologians whether the story is to be understood as an actual transformation of water into wine, or as a spiritual allegory. Interpreted allegorically, the good news and hope implied by the story is in the words of the steward of the Feast when he tasted the good wine, "Everyone serves the good wine first, and then the inferior wine after the guests have become drunk. But you have kept the good wine until now" (John 2:10, NRSV). This could be interpreted by saying simply that it is always darkest before the dawn, but good things are on the way. The more usual interpretation, however, is that this is a reference to the appearance of Jesus, whom the author of the Fourth Gospel regards as being himself "the good wine". The story has had considerable importance in the development of Christian pastoral theology. Fulton J. Sheen thought that it is very likely that it was one of Mary's relatives who was being married. The gospel account of Jesus being invited to a marriage, attending, and using his divine power to save the celebrations from disaster are taken as evidence of his approval for marriage and earthly celebrations, in contrast to the more austere views of Paul the Apostle as found, for example, in 1 Corinthians 7. It has also been used as an argument against Christian teetotalism. The miracle may also be interpreted as the antitype of Moses' first public miracle of changing water (the Nile river) into blood. This would establish a symbolic link between Moses as the first savior of the Jews through their escape from Egypt and Jesus as the spiritual savior of all people. Some commentators have speculated about the identity of the unnamed bridegroom. One tradition, represented by Thomas Aquinas among others, hold that the bridegroom was St John the Evangelist himself. Bishop John Spong suggests in his book Born of a Woman that the event was actually the wedding of Jesus himself to Mary Magdalene. In 1854, at a time when polygamy was an element of mainstream Mormon belief, the Mormon elder Orson Hyde made a similar suggestion, arguing that Jesus was a polygamist and that the event at Cana was his wedding to Mary Magdalene, Martha and Mary of Bethany. The "Wedding church" in Kafr Kanna, Israel, a pilgrimage site believed by many Christians to be the site of the biblical marriage. The exact location of Cana has been subject to debate among scholars. Modern scholars maintain that since the Gospel of John was addressed to Jewish Christians of the time, it isn’t likely that the evangelist would mention a place that did not exist. Villages in Galilee which are candidates for historical Cana are: Kafr Kanna, Kenet-l-Jalil (also called Khirbet Kana) and Ain Qana and Qana in southern Lebanon. According to the Catholic Encyclopedia of 1914, a tradition dating back to the 8th century identifies Cana with the modern Arab town of Kafr Kanna, about 7 km northeast of Nazareth, Israel. Other suggested alternatives include the ruined village of Kenet-el-Jalil (also known as Khirbet Kana), about 9 km further north, and Ain Qana, which is closer to Nazareth and considered to be a better candidate on etymological grounds. Some Christians, especially Lebanese Christians, believe the southern Lebanese village of Qana to have been the actual location of this event. In the journal Biblical Archaeological Review, Michael Homan argues that many biblical scholars have misinterpreted early texts, translating to 'wine' when the more sensible translation is 'beer'. 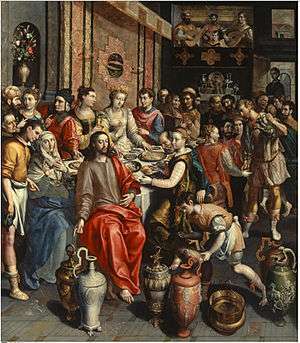 Depictions of Marriage at Cana are numerous in art history. Wikimedia Commons has media related to Marriage at Cana. ↑ e.g. Smith, D. M. (1988), John, in Mays, J. L. (Ed. ), Harper's Bible Commentary (pp. 1044-1076), San Francisco: Harper. ↑ John Shelby Spong, Born of a Woman (Harper, 1992) pages 187-199. ↑ "Catholic encyclopedia: Cana". Newadvent.org. 1908-11-01. Retrieved 2012-05-16. ↑ "Lebanese Town Lays Claim To Jesus Christ's First Miracle", Associated Press, January 12, 1994.